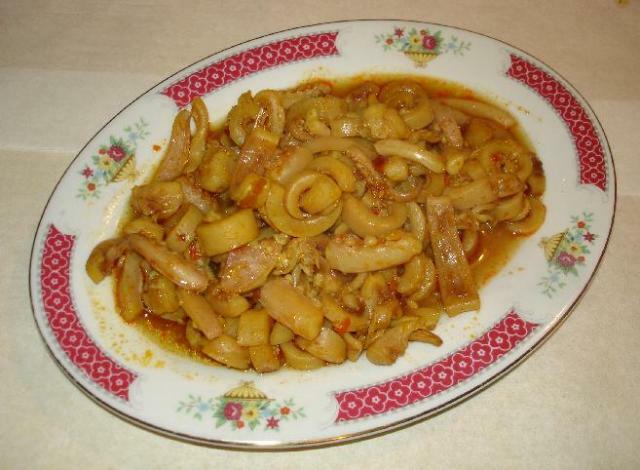 This dish may be found in some dim sum restaurants: Steamed curry squid. It is quite easy to make at home. The key is in the marination. I used reconstituted dried squid to make this dish. You may also use fresh squid instead. My experience has been that the smaller the squid, the tastier. 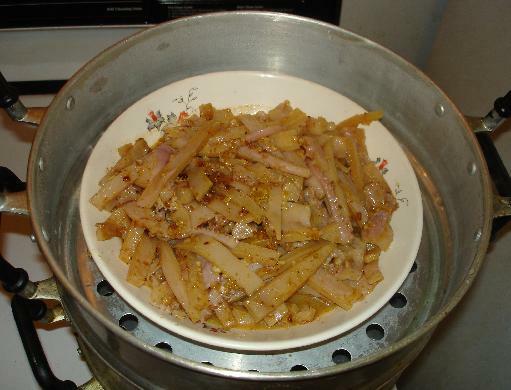 Soak the reconstituted dried squid in water for about 30 minutes. Rinse it thoroughly. Drain the water well. 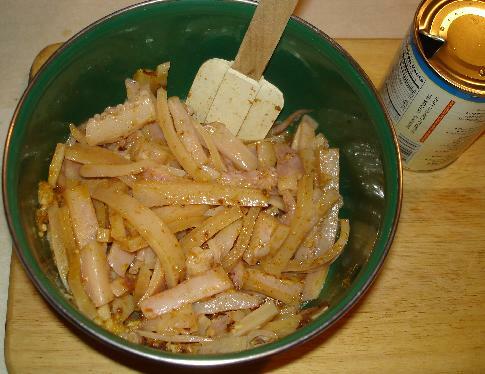 To marinate: Place the squid in a mixing bowl. If you are a fan of MSG, this is the time to sprinkle some on top. 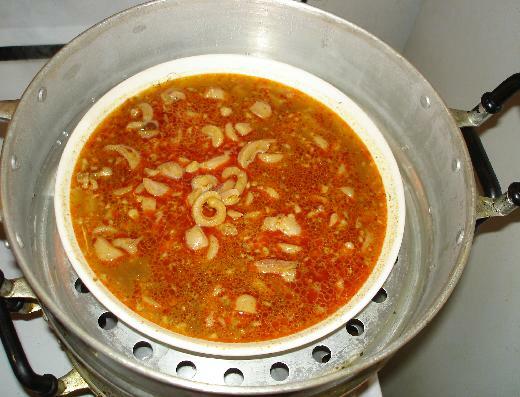 Transfer the marinated squid to a steaming dish. Cooking is very simple: place the dish in a steamer and steam for 20 minutes. To avoid getting excess water condensation in the dish, I advise to place a plate on top to cover the steaming dish to block off some of the water condensation. 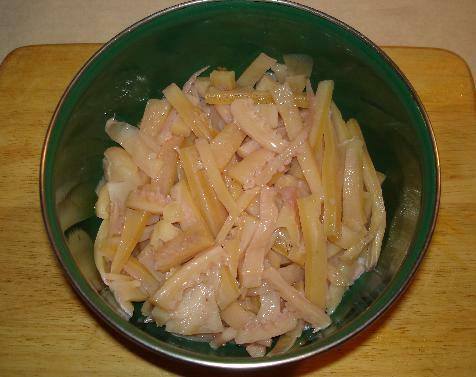 This is what the dish looked like after 20 minutes. 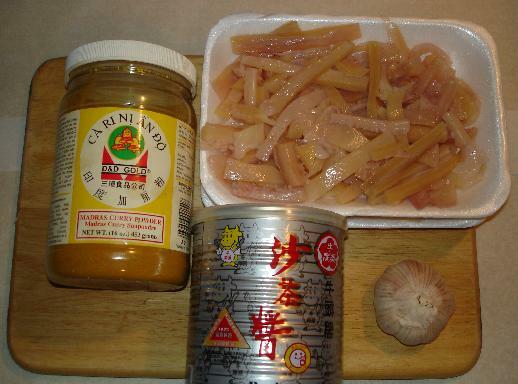 Scoop and transfer the squid along with some sauces to the serving plates (or small dim sum dishes). Picture of the finished dish. 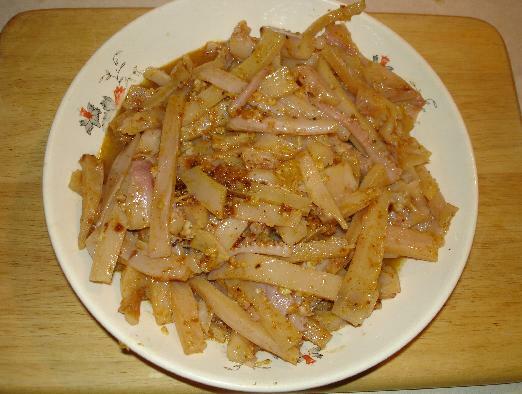 Ah Leung Kuo,another great but simple dish.Will try it out. The dilemma is using fresh squid against the dried ones.I personally feel the dried ones have more flavour,while I like the feel and texture of the fresh ones.BTW,is half an hour soaking enough? I have seen my mom soaking it overnight. BTW,is half an hour soaking enough? I have seen my mom soaking it overnight. The kind I used is already reconstituted at the store. If you start from the dried squid, then yes a much longer soaking time is needed. But simply by soaking in water is not enough to make it edible (too tough). 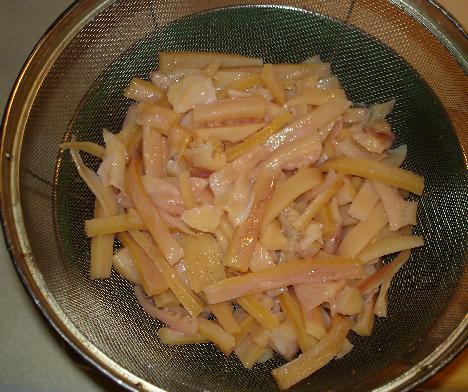 I believe they need to add something like Sodium Carbonate (Soda) to the water when soaking dried squid. I haven't quite learned the portion or steps. I usually buy the "ready to cook" type of reconstituted squid from the stores. But simply by soaking in water is not enough to make it edible (too tough). 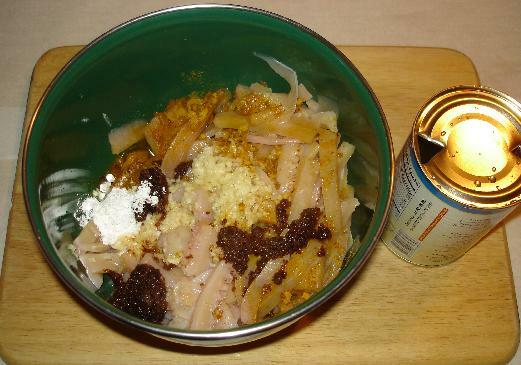 I believe they need to add something like Sodium Carbonate (Soda) to the water when soaking dried squid. I haven't quite learned the portion or steps. I usually buy the "ready to cook" type of reconstituted squid from the stores. You are right,now that jogs my memory,got to check with my mom,she used to add soda and then there was a cleaning process involved. I dont think I have seen reconstituted dried squid here in Toronto,but I maybe wrong,will keep a lookout for it. Xiao Leung -- Is that Madras a deep-flavored curry? Aeons ago I used to get one from a small store, and I absolutely loved it's flavor. So much depth, not too hot, but strongly curry. Then the store went out of business, and I was never able to fing that jar again. I never really looked at the brand, but it was a more orange color than the one you show. Toronto! Big Chinese population. I think you should be able to find reconstituted squid in the Chinese market. Xiao Leung -- Is that Madras a deep-flavored curry? Aeons ago I used to get one from a small store, and I absolutely loved it's flavor. So much depth, not too hot, but strongly curry. The Madras type is the one liked by Hong Kongers. It has more tumeric powder (thus the yellow color) than other curry mixes. Man, this looks great!!!! The street version has fishball and fried pork skin in it. Do you recommend using the Korean dried squid?. Looks great and quite yummy! Sorry. I don't know what Korean dried squid is like. 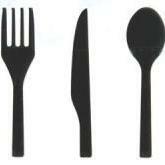 Are they different from Chinese ones?